This post is sponsored by Hooked. Thank you for supporting the sponsors who make SitePoint possible. Every time my phone vibrates for two seconds, I get excited. Itâ€™s a classic Pavlovian response to an external stimuli. I should know better, but I just cant help it. Iâ€™ve gotten quite comfortable with this pattern. So comfortable in fact that Iâ€™m no longer surprised by the notification. Instead, I now find that I am expecting it throughout the day. Craving it, almost. Itâ€™s gotten so bad that sometimes Iâ€™ll convince myself that Twitter forgot to notify me, and Iâ€™ll need to go and check my notifications manually. This behavioral pattern should be starting to sound familiar. It can happen with any product, and it doesnâ€™t mean youâ€™re addicted, imbalanced, unstable, or weird. What it really means is that youâ€™re normal. It means that a small army of neuroscientists, product managers, and behavioural psychologists have discovered the key to building habit forming technology, and this has been built into the very product that you canâ€™t seem to keep your hands off. Whatâ€™s the key to building successful habit-forming technology, you ask? Thatâ€™s the perfect question for Nir Eyal, who just so happened to write a book on the subject. I had the chance to read a sample chapter from Hooked, and I have to say, this is not one to miss. As web developers, weâ€™re constantly pushing out software that we hope will be adopted by a large amount of users every day. UX, SEO, and design all play an important part in the success of the software weâ€™re building, but the most successful products use those tools to achieve a much larger goal. A goal that goes on to create the addictive pattern weâ€™re all familiar with in products like Twitter, Facebook, and Instagram. That goal is described as The Hook Model, which has four phases: trigger, action, variable reward, and investment. The Hook Model explains the rationale behind the design of many successful habit-forming products and services we use daily. Though not exhaustive given the vast amount of academic literature available, the model is intended to be a practical tool (rather than a theoretical one) made for entrepreneurs and innovators who aim to use habits for good. In this book, I have compiled the most relevant research, shared actionable insights, and provided a practical framework designed to increase the innovatorâ€™s odds of success. Hooked strikes me as well written, thoroughly researched, and highly convincing. One thing I really took notice of was the way that the content is summarized after every chapter. Each chapter is ended with a summarized list of action items and important highlights, enabling the reader to discuss or take notes on the most important aspects of that chapter. I really enjoy this format, because after reading such an important book, I can always go back to each chapter and easily reference its main points and ideas. Nir is an excellent writer, and all his claims are backed by an exhaustive list of resources, including research papers, industry experts, and his own experience in working with startups and large companies alike. I was also surprised to see that Ryan Hoover was a contributing author. If you donâ€™t know the name, you probably do know the website he founded, Product Hunt. This is definitely a book Iâ€™m excited to own, especially as a web developer releasing products and software aimed at solving specific problems for a large amount of users. I have no doubt Hooked will pay for itself several times over, by providing useful information relevant to the industry Iâ€™m proud to be a part of. If youâ€™re currently building a product, on a product team, or hope to launch your own product in the future, Hooked is the book for you. It will show you how product teams form strong user habits, ensuring their success and popularity. This isnâ€™t a process that is covered in depth anywhere else, making it a must read for those looking to build habit forming products and technology. Hooked is available on Amazon, Barnes & Noble, and IndieBound.org. After you buy, be sure to check out HookModel.com for a special offer! How do successful companies create products people canâ€™t put down? 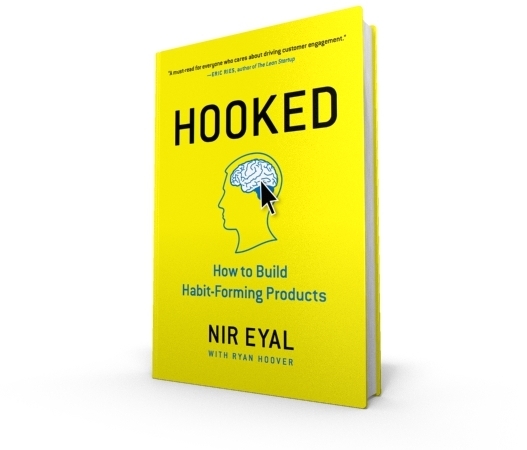 Nir Eyal answers these questions (and many more) in his book Hooked: How to Build Habit-Forming Products. Hooked explains the hidden psychology behind how products create users habits. Hooked is not abstract theory, but a how-to guide for building better products. Hooked is written for product managers, designers, marketers, start-up founders, and anyone who seeks to understand how products influence our behavior. â€œHooked gives you the blueprint for the next generation of products. Read Hooked or the company that replaces you will.â€� â€”Matt Mullenweg, Founder of WordPress.